Got Weeds? You might have noticed a bumper crop of early spring weeds this past year. Cool spring temperatures combined with rainfall last fall through winter created the perfect conditions for vigorous weed growth. Even though these environmental conditions are beyond our control, there are some steps you can take to discourage these weeds and give your lawns a boost. Reduce lawn watering late-fall through winter: We see the worst weed infestations in lawns where regular winter and early spring over-watering has occurred. If you’ve been watering your lawns once or twice per week during the warm season, you need to reduce this during cooler weather. If you don’t you’re probably over-watering, and watering the weeds! When we’re experiencing regular rainfall during cooler months, you can turn off your irrigation to lawn areas until temperatures rise and rainfall ceases. You may only need to run irrigation once per month over the winter. Water trees and landscape plants as needed, separately from lawn areas. Mow earlier and more frequently: Mowing gives your lawn the competitive advantage it needs during times of high weed pressure. In early spring, mowing low and often will help the soil temperature increase sooner, to encourage your lawn to come out of dormancy. Tall weeds shade the soil and keep temperatures cooler, block needed sunlight and spread more weeds if they are allowed to flower. Our impact on the environment and our drinking water. All chemicals have a harmful effect on lawn grasses and their root systems. Chemicals kills beneficial soil life such as earth worms, which increases soil compaction. Increased soil compaction decreases water holding capacity and root growth, which means you’ll have to water your lawns more often. It is important to remember that weeds are not a sign that the soil is unhealthy. 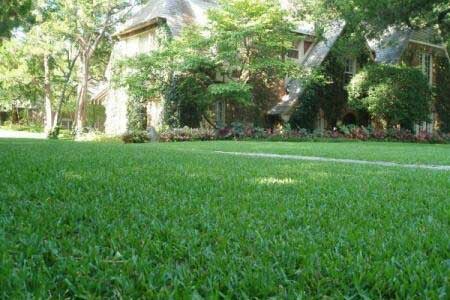 Proper watering and maintenance of lawns can naturally reduce overall weed pressure. In order to eradicate every single weed in a landscape, we’d have to use chemicals. We feel that would be taking one step forward, but many steps back. The best thing you can do to encourage a healthy lawn with minimal weed competition is to encourage a healthy soil and water properly. Now is a great time to applyLiquid Compost Extract to your lawns, before fall weed-seed germination. Check our out Lawn Watering Guide for more details.